Guest Post to sfdcpoint.com Want to contribute an article to sfdcpoint.com? Please share your post to dureja.ankush90@gmail.com. Purpose of sfdcpoint.com is to share knowledge with salesforce community. So all of you are welcome to post your article on sfdcpoint.com. Article Quality : Try to write an article with more than 300 words. Screenshot: Sometime image speaks more than words. So its advisable to add some screenshot. Video: If possible, add some video for demo. Its not necessary. Send your article to dureja.ankush90@gmail.com with subject line sfdcpoint guest post. We will review your post. Once approved we will post your article to sfdcpoint with your name. You will also be rewarded with some goodies. Salesforce admin interview questions and answers. What are different types of cloud computing? What are different Salesforce Editions? What is difference between Salesforce.com and Force.com? Different types of object in Salesforce.com? How many relationship types are in Salesforce? What are the difference between a Role and Profile? What are the different Report Formats? What is Conditional Highlighting in Salesforce report? Which field type does Bucketing field support? What are the different Dashboard Component? What is Chatter in Salesforce? Salesforce is the world’s #1 customer relationship management (CRM) platform. Salesforce provides cloud-based, CRM applications for sales, service, marketing, and more. Salesforce has essentially changed how enterprise software is delivered and used. Its software is cloud-based and hence doesn’t need IT experts to set up anything. Salesforce has defined the ideal way as how to connect with customers. Building meaningful and lasting bond with the customers, identifying their needs, address problems faster and deploy apps that are customer focused is all possible through Salesforce. Salesforce Technologies is one of the leading and very hot Technology in IT industry. Through Salesforce.com Technology thousands of Job opportunity are created for Salesforce developers and Salesforce Administration Job Seekers. As per Forbes magazine, nearly 55% of enterprises predict cloud computing will enable new business model in three years. So Salesforce is one of the Cloud Computing Technology which have bright future in the upcoming years. Salesforce provides different enterprise cloud computing applications to all size industries and businesses. Salesforce applications are provided on subscription basis primarily through direct sales effort and indirectly through partners. CRM means “Customer Relationship Management “. We can understand from the full form where CRM is an application used to automate Sales and marketing functions by a using a Software called CRM Software. By using CRM Software every Company / Organization plans to increase their revenues and profits. This strategy of increasing revenue is done mainly by attracting Customers, clients, Sales etc. There are several types of PaaS. Every PaaS option is either public, private, or a hybrid mix of the two. Public PaaS is hosted in the cloud, and its infrastructure is managed by the provider. Private PaaS, on the other hand, is housed in onsite servers or private networks and is maintained by the user. Hybrid PaaS uses elements from both public and private and is capable of executing applications from multiple cloud infrastructures. Essentials: Designed for small businesses that want to get started with a CRM system quickly. It includes intuitive walkthroughs and a setup assistant to get started, an easy-to-use UI, and administration tools to customize your deployment as you grow. Professional: Designed for businesses requiring full-featured CRM functionality. It includes straightforward and easy-to-use customization, integration, and administration tools to facilitate any small to midsize deployment. Enterprise: Meets the needs of large and complex businesses. It gives you advanced customization and administration tools, in addition to all the functionality available in Professional Edition, that can support large-scale deployments. Enterprise Edition also includes access to Salesforce APIs, so you can easily integrate with back-office systems. Unlimited: Maximizes your success and extends it across the entire enterprise through the Lightning Platform. It gives you new levels of platform flexibility for managing and sharing all your information on demand. Includes all Enterprise Edition functionality, Premier Support, full mobile access, unlimited custom apps, increased storage limits, and other features. Developer: Provides access to the Lightning Platform and APIs. It lets developers extend Salesforce, integrate with other applications, and develop new tools and applications. Developer Edition also provides access to many of the features available in Enterprise Edition. Salesforce.com and fore.com are relatively same but they are different in their functionality. Salesforce.com is used to develop CRM functionality based application where force.com is used to customize our data model, business logic and User interface. Database.com is a type of service provided by Salesforce.com to enhance the power of Salesforce.com CRM applications. Database.com provides “Data as a Service” to subscribers. An Objects is represented as a database table which stores organization data . Objects consists of set of fields and we store data against that field. To view data Salesforce provided TABS. To create custom fields go to Setup=>Build=>Create=>Object. Standard Objects :- Standard objects are called so because they are created and provided by Salesforce.com. Custom Objects :- Custom objects are those which are created by an User in salesforce.com. Master-detail closely links objects together such that the master record controls certain behaviors of the detail and subdetail record. For example, you can define a two-object master-detail relationship, such as Account—Expense Report, that extends the relationship to subdetail records, such as Account—Expense Report—Expense Line Item. You can then perform operations across the master—detail—subdetail relationship. Many-to-many You can use master-detail relationships to model many-to-many relationships between any two objects. A many-to-many relationship allows each record of one object to be linked to multiple records from another object and vice versa. For example, you create a custom object called “Bug” that relates to the standard case object such that a bug could be related to multiple cases and a case could also be related to multiple bugs. 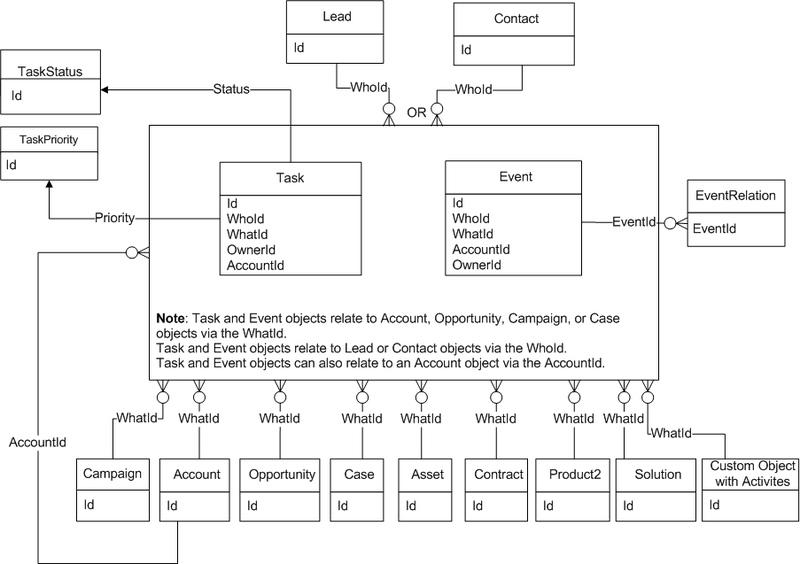 Link an object with itself (with the exception of the user object; see Hierarchical). For example, you might want to link a custom object called “Bug” with itself to show how two different bugs are related to the same problem. External lookup An external lookup relationship links a child standard, custom, or external object to a parent external object. When you create an external lookup relationship field, the standard External ID field on the parent external object is matched against the values of the child’s external lookup relationship field. External object field values come from an external data source. Indirect lookup An indirect lookup relationship links a child external object to a parent standard or custom object. When you create an indirect lookup relationship field on an external object, you specify the parent object field and the child object field to match and associate records in the relationship. Specifically, you select a custom unique, external ID field on the parent object to match against the child’s indirect lookup relationship field, whose values come from an external data source. Hierarchical A special lookup relationship available for only the user object. It lets users use a lookup field to associate one user with another that does not directly or indirectly refer to itself. For example, you can create a custom hierarchical relationship field to store each user’s direct manager. A roll-up summary field calculates values from related records, such as those in a related list. You can create a roll-up summary field to display a value in a master record based on the values of fields in a detail record. The detail record must be related to the master through a master-detail relationship. For example, you want to display the sum of invoice amounts for all related invoice custom object records in an account’s Invoices related list. You can display this total in a custom account field called Total Invoice Amount. It give access for users higher in the hierarchy to all records owned by users below them in the hierarchy. Role hierarchies don’t have to match your organization chart exactly. Instead, each role in the hierarchy should represent a level of data access that a user or group of users needs. Roles are one of the ways you can control access to records. They also impact reports (e.g. “My Teams” filter). Roles come into play if your security model (OWDs) are set to private. In simple words, Roles are one of the ways you can control access to records and Profiles determine what the User can do, view or edit on that record. A Reports is a set of records displayed in the form of rows and columns. Reports data can be filtered, grouped, and displayed graphically as a chart. Reports are stored in Folder – which controls who has access. Tabular Reports, Summary Reports, Matrix Reports, Joined Reports. It is the simplest and fastest report formats. It displays the rows as records and fields are listed as columns just like a spreadsheet. It supports sorting of records. This report allows the user to group rows of data, summarize the field value which also supports sorting and display subtotals. In this report, records are summarized in a grid format. It allows the records to be grouped by both columns and rows. In this type of report, User can create multiple report blocks that provide different different views of your data. In this format of report, we organize the data in the form of block. You can add upto 5 blocks in a single report. Each block is defined as a Sub-report(Report Type). It can have its own field, columns, sorting and filtering. limits. Using Conditional Highlighting, We can specify colours for different ranges of values in reports. Bucketing lets you quickly categorize report records, without having to create a formula or a custom field. It supports the field type of Picklist, Number, Text. Salesforce Dashboard is the visual representation of snapshots that are generated from Salesforce reports data. Using Salesforce Dashboard components, you can convert business requirements in Graphical representation using Sales force reports. Like reports, Dashboard are also stored in Folders. Scatter Chart, Line Chart, Funnel Chart, Vertical Bar Chart, Donut Chart, Horizontal Bar Chart, Pie Chart, Gauge, Metric, Table, Visual force Pages. Workflow rules are the automated process used in business process to send Email Alerts, Assign a Task, Update a field on rule criteria or action based criteria requirements. Email Alert: Send an Email. Field update: Update a Field. Outbound Message: Send an Outbound Message to External System. The workflow that are scheduled to happen at a later time. Approval Process are used in the business process to Approve or Reject the record. submits that record for Approval. Assignment Rules automatically assign incoming Leads & Cases to specific agents so that the right people work on the right leads and cases. Queues allow the group of users to manage a shared workload more efficiently It prioritize your support team’s workload by creating lists from which specific agents can jump in to solve certain types of cases. Auto Response Rules Automatically send personalized email templates for new cases and new leads from your website. Escalation Rules , Automatically escalate cases to the right people when the cases aren’t solved by a certain time. Chatter is a Salesforce real-time collaboration application that lets your users work together, talk to each other, and share information. 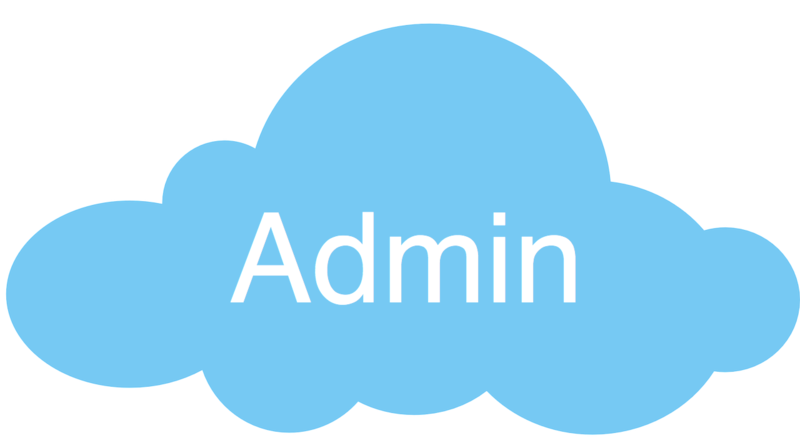 I will keep adding more questions to Salesforce admin interview questions. Tables can be populated during initialization using the data, columns, and keyField attributes. The keyField attribute is required for correct table behavior. It will associate each row with a unique identifier. The below code shows how to use the lightning: datatable to initialize the data and columns which are passed by using attributes. In this example, we will simply display list of account using lightning:datatable. Use the following column properties to customize the behavior and visual aspects of your columns. actions object Appends a dropdown menu of actions to a column. You must pass in a list of label-name pairs. cellAttributes object Provides additional customization, such as horizontal alignment or appending an icon to the output. For more information about alignment, see Aligning Data in a Column. For more information about adding icons, see Appending an Icon to Column Data. editable boolean Specifies whether a column supports inline editing. The default is false. fieldName string Required. The name that binds the columns properties to the associated data. Each columns property must correspond to an item in the data array. fixedWidth integer Specifies the width of a column in pixels and makes the column non-resizable. iconName string The Lightning Design System name of the icon. Names are written in the format standard:opportunity. The icon is appended to the left of the header label. initialWidth integer The width of the column when it's initialized, which must be within the minColumnWidth and maxColumnWidth values, or within 50px and 1000px if they are not provided. label string Required. The text label displayed in the column header. sortable boolean Specifies whether the column can be sorted. The default is false. type string Required. The data type to be used for data formatting. For more information, see Formatting with Data Types. typeAttributes object Provides custom formatting with component attributes for the data type. For example, currencyCode for the currency type. For more information, see Formatting with Data Types. What is difference between WhoId and WhatId? WhoID in Salesforce refers to people things. So that would be typically a Lead ID or a Contact ID. The WhoId represents a human such as a lead or a contact. WhoIds are polymorphic. Polymorphic means a WhoId is equivalent to a contact’s ID or a lead’s ID. The label is Name. WhatID in Salesforce refers to object type things. That would typically be an Account ID or an Opportunity ID. The WhatId represents nonhuman objects such as accounts, opportunities, campaigns, cases, or custom objects. WhatIds are polymorphic. Polymorphic means a WhatId is equivalent to the ID of a related object. The label is Related To. These fields are available on Task and Event Object. In SOQL query these fields can simply be queries similar to other fields. In this post, we will see how we can use Lightning Components in Visualforce Pages or how to display Lightning Component In Visualforce Page. Even though the use of lightning is growing day by day, still some customers are using salesforce classic because of many reasons. Sometimes there is a requirement to use lightning component in visualforce page. Lightning Components for Visualforce is based on Lightning Out, a powerful and flexible feature that lets you embed Lightning components into almost any web page. When used with Visualforce, some of the details become simpler. For example, you don’t need to deal with authentication, and you don’t need to configure a Connected App. In this example, we will see a very basic example of the lightning component and then display lightning component in the visualforce page. Here important point is that ltng:outApp needs to be extended in app. ltng:outApp adds SLDS resources to the page to allow our Lightning components to be styled with the Salesforce Lightning Design System. If we don’t want SLDS resources added to the page, we need to extend from ltng:outAppUnstyled instead. In the above Visualforce page, apex:includeLightning tag imports necessary dependencies and scripts to enable Visualforce to act as Lightning component container. We can use $Lightning.createComponent create Lightning Component dynamically. We can call $Lightning.use() multiple times on a page, but all calls must reference the same Lightning dependency app. We can also pass parameters from visualforce page to lightning component. Check wrapper class in lightning component salesforce link. Please check Salesforce lightning link for more posts related to lightning. Let’s see an example of wrapper class in lightning component salesforce. In this example, we will create AcoountContactWrapper and will display account and contact details and display on lightning component. //set response value in wrapperList attribute on component. Problem is Lightning components can’t use inner classes as attribute type when the org has setup a namespace. For more details refer below known issue link. But now it does not work and we have to use Object as type. Integration is a process of connecting two applications. A typical enterprise uses many applications, many or most of which are not designed to work with one another out of the box. Integrating separate but related apps helps organizations achieve greater levels of operational consistency, efficiency, and quality. Each application can have data, business logic, presentation, and security layers, all of which are possible targets for integration. This page is an overall launch point for exploring the various integration options related to Force.com and other Salesforce platform technologies. What are possible Ways to Integrate with Salesforce Force.com? Business Logic Integration: It uses Apex Web Services for Inbound and Apex Callouts for Outbound. It typically handles a scenario where business logic is spread across several applications to implement the complete end-to-end business process. An example would be building complex logic on the data received before committing it into Salesforce. Data Integration:It uses SOAP APIs and REST APIs. It typically handles data synchronization requirements, where one application in an enterprise acts as the primary source for a particular business object, like Account. Webservices is a functionality or code which helps to us to do integration. Web services are open standard (XML, SOAP, HTTP, etc.) based web applications that interact with other web applications for the purpose of exchanging data. Web services can convert your existing applications into web applications. Protocal is a set of mutually accepted and implemented rules at both ends of the communications channel for the proper exchange of information. How many types of API’s avaliable in salesforce? REST API provides a powerful, convenient, and simple REST-based web services interface for interacting with Salesforce. Its advantages include ease of integration and development, and it’s an excellent choice of technology for use with mobile applications and web projects. For certain projects, you may want to use REST API with other Salesforce REST APIs. To build UI for creating, reading, updating, and deleting records, including building UI for list views, actions, and dependent picklists, use User Interface API. To build UI for Chatter, communities, or recommendations, use Chatter REST API. If you have many records to process, consider using Bulk API, which is based on REST principles and optimized for large sets of data. Use Chatter REST API to display Chatter feeds, users, groups, and followers, especially in mobile applications. Chatter REST API also provides programmatic access to files, recommendations, topics, notifications, Data.com purchasing, and more. Chatter REST API is similar to APIs offered by other companies with feeds, such as Facebook and Twitter, but it also exposes Salesforce features beyond Chatter. Use Streaming API to receive near-real-time streams of data that are based on changes in Salesforce records or custom payloads. For Salesforce record changes, Salesforce publishes notifications when the changes occur. For custom notifications, you can publish event messages. Subscribers can receive notifications using CometD—an implementation of the Bayeux protocol that simulates push technology. Clients can subscribe to some types of events with Apex triggers or declaratively with Process Builder and flows. What is Call In and Call Out? Call In is used to exposing our webservices to another system. Call out enables you to tightly integrate your Apex with an external service by making a call to an external Web service or sending a HTTP request from Apex code and then receiving the response. What is difference between Enterprise WSDL and Partner WSDL? The Enterprise WSDL is strongly typed. The Enterprise WSDL is tied (bound) to a specific configuration of Salesforce (ie. a specific organization’s Salesforce configuration). The Enterprise WSDL changes if modifications (e.g custom fields or custom objects) are made to an organization’s Salesforce configuration. The Partner WSDL is loosely typed. The Partner WSDL can be used to reflect against/interrogate any configuration of Salesforce (ie. any organization’s Salesforce configuration). How SOAP can be accessed ? How to generate WSDL file? In the application, from Setup, enter Apex Classes in the Quick Find box, then select Apex Classes. Click Browse to navigate to a WSDL document on your local hard drive or network, or type in the full path. This WSDL document is the basis for the Apex class you are creating. Click Parse WSDL to verify the WSDL document contents. The application generates a default class name for each namespace in the WSDL document and reports any errors. Parsing fails if the WSDL contains schema types or constructs that aren’t supported by Apex classes, or if the resulting classes exceed the 1 million character limit on Apex classes. For example, the Salesforce SOAP API WSDL cannot be parsed. Modify the class names as desired. While you can save more than one WSDL namespace into a single class by using the same class name for each namespace, Apex classes can be no more than 1 million characters total. Click Generate Apex. The final page of the wizard shows which classes were successfully generated, along with any errors from other classes. The page also provides a link to view successfully generated code. What is remote site settings ? How manys ways to XML parsing ? How to read root element in XML DOM ? How to read child element in XML DOM ? How to read all child elements in XML DOM ? How to read text between tags ? How SOAP and REST will Communicate ? SOAP will communicate through WSDL file. REST will communicate through HTTP protocol. HTTPGET : Retrieve data identified by a URL. HTTPPOST : Create a resource or post data to the server. HTTPDELETE : Delete a resource identified by a URL. HTTPPUT : Create or replace the resource sent in the request body. What is difference between SOAP and REST? SOAP API: The Simple Object Access Protocol (SOAP) is an attempt to define a standard for creating web service APIs. It is a pattern, a web service architecture, which specifies the basic rules to be considered while designing web service platforms. It typically uses HTTP as a layer 7 protocol, although this is not mandatory. The SOAP message itself consists of an envelope, inside of which are the SOAP headers and body, the actual information we want to send. It is based on the standard XML format, designed especially to transport and store structured data. SOAP may also refer to the format of the XML that the envelope uses. SOAP is a mature standard and is heavily used in many systems, but it does not use many of the functionality build in HTTP. While some consider it slow, it provides a heavy set of functionality which is a necessity in many cases. It might now be the best solution for browser-based clients, due to its custom format. Supports data in the form of XML only and not JSON. Use SOAP API in any language that supports Web services. REST API: The Representational State Transfer (REST) is another architectural pattern (resource-oriented), an alternative to SOAP. Unlike SOAP, RESTful applications use the HTTP build-in headers (with a variety of media-types) to carry meta information and use the GET, POST, PUT and DELETE verbs to perform CRUD operations. REST is resource-oriented and uses clean URLs (or RESTful URLs). I will keep adding more questions to Salesforce Integration Interview questions and answers. Please add your comments or questions to Salesforce Integration Interview questions and answers. Salesforce Email service is automated process that use Apex class to process inbound email. When we set up an email service, we need to generate a special email address in which salesforce will receive your emails. We also need to create one apex class to implement Messaging.InboundEmailHandler interface . 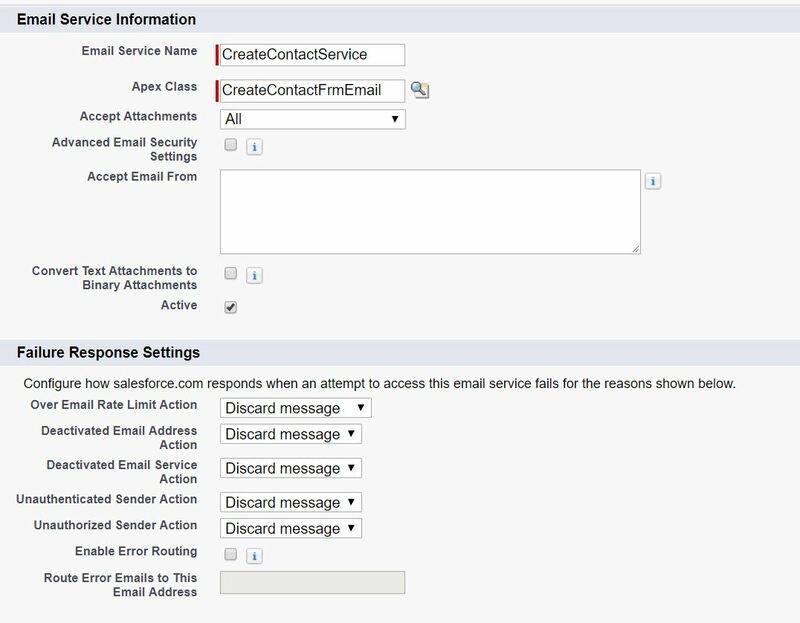 The email services will then invoke a handleInboundEmail method on the Apex class whenever an email is received on the email address. Lets create very simple email service which will create contact when an email is sent to salesforce. First of all we need to create Apex class that implement the Messaging.InboundEmailHandler interface. Its necessary to implement Messaging.InboundEmailHandler interface. Using the handleInboundEmail method in that class, you can access an InboundEmail object to retrieve the contents, headers, and attachments of inbound email messages, as well as perform many functions. This class will handle email message. Click on Save or Save and New email address. Click on save. New email address will be created in related list. We need to send email to generated email address to test email service. You can copy email address from email service related list so that we can use it for testing. For testing send an email to this email id with subject ‘Create Contact’ and add some body which will be saved in last name. We can also add attachment(its optional) in email. As contact last name is required field on contact object, so it is necessary to enter text body in email. For more details about email service please this link from salesforce. System.NullPointerException: Attempt to de-reference a null object is very common error in apex class. It occurs when your variable (sobject, list, set or any other data type) is not initialized (allocated memory). In order to use the non primitive data type in the code we need to initialize the memory first. If we don’t do that it may result in Attempt to de-reference a null object error. This error may occur in Apex classes, Visualforce pages with Apex controller, Test classes, Apex Triggers. It will result in attempt to de-reference a null object error. Above code will also result in error. Here in above code accountIdAccountMap or accRecord can be null. So we should do null check before using it like this. If you get System.NullPointerException. Its advisable to use System.debug to debug line of code which is resulting in this error and then fix it.